Did you know that I am one of the very few photographers out there who offer “older newborn” photo sessions? Most photographers will tell you that they won’t photograph your newborn if he or she is older than 2 or 3 weeks, and will tell you of the so-called “window” during which they can photograph newborns.Let me break this down for you. 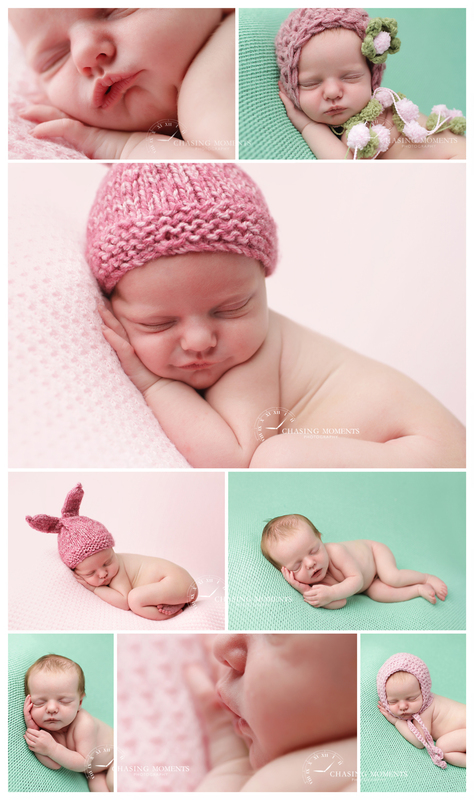 True, most newborns will “curl up” and “pose” for sleepy shots in the first couple of weeks of life. Within a few short weeks of birth, newborns become a lot more alert and aware of their surroundings, they get stronger and like to stretch out, kick and wiggle! They also sleep less and stay awake more. This, in a nutshell, is the reason “traditional” newborn sessions are done in the first couple of weeks after birth. I have worked with many “older” newborns (4 weeks and older) to offer special “older newborn” studio sessions, which take into account older babies’ physiology and reflexes and during which I still capture the “newborn” look of your baby and in many cases manage to get a combination of “asleep” and “awake” images. True, with older newborns it’s unlikely that I will deliver traditional curled up asleep poses, but there are still so many wonderful looks, poses and images that can be captured! Here are some examples from an “older newborn” session with a 2-month old baby boy. If you have a newborn and somebody told you that you can’t get newborn photos done any more just because you missed the magic “window’ – please contact me, and we’ll talk! I recently had the honor to photograph this beautiful newborn baby girl, she was such a happy little lady and even gave me some beautiful smiles during the session. We had some standard shots with mommy and daddy and posed pictures of baby (oh, the bright colorful tutu mommy brought for her baby girl was to die for – a fun splash of color! ), and then we also did a unique setup that mommy requested – she had a mermaid outfit that she brought in, and we put together an “ocean” look, which I think turned out very cute! Enjoy! This little lady is officially one of the toughest newborn clients I’ve ever photographed; she really did not want to be photographed, awake or asleep, and her mommy (who also takes “the most patient client” award) and I worked really hard to help her settle down for a couple of shots. I think we got some gorgeous shots, and the sibling shot is one of my all time favorites. A few weeks ago, I got to photograph this precious baby boy J. who came to my McLean studio from Alexandria. He was around 5 weeks old at the time of the session (so, no traditional “curled up, sleepy” poses), but we still got some precious photos of him alone and with family. Mom especially wanted to get photos with big brother, which we did, and we also got some great family shots, Mommy-and-me photos, and some images I traditionally do with newborns (baby in parents’ arms, the last two below), which are also easy to do with older newborns. My favorite? The family shot! LOVE how the big brother is having a big belly laugh! In an effort to catch up with blogging and posting photos from recent sessions, here is one of my favorite sessions from this year. This mommy brought her gorgeous newborn baby girl from Ashburn to my McLean studio, and – oh, be still, my heart! Oh, wow, this is a long post, so many gorgeous photos to share! This was, by the way, a very simple session – three beanbag fabrics – white fur, black, and brown. And turned out so amazing! Also, I know I posted this earlier, but I thought I’d repost on here again – here is a look at wall art collages and arrangement I work up for my clients – makes me want to order all of them Photos look totally different when presented as collages or wall art and give clients a great idea what to order without any guess work. This one is my absolute favorite!!! The client ordered this as a large wall arrangement, and so did I – the studio sample is now up in my McLean studio wall – come see what a 30 by 40 canvas looks like (and see for yourself that an 8×10 or even 16×20 is really tiny). But, jokes aside, I do custom rotations, touch ups, wrap arounds to make sure pictures go well together, canvases have perfectly wrapped around edges, and the sizing is right for everything. Phew! One long post – thanks for sticking with me! This morning I had the privilege to photograph three sweet, beautiful newborn baby boys who came to my McLean studio from Falls Church; let me tell you – it was a marathon of feeding, burping, rocking, soothing and posing What an amazing experience, and I am sooooooo in awe of this family! Hope to see these little guys for their 1-year photos next year! Meet newborn triplets D., H., and J.
Centreville Newborn Photographer: Sneak Peek for Baby L.
I finally got to meet beautiful baby L. today! “Finally” because our session was originally scheduled for last weekend, but got moved. Baby L. was quite alert for almost the first two hours of the session (and I was already getting worried about getting some of the “sleepy” shots Mom and Dad really wanted), and then magically went to sleep and let me get some beautiful shots! One of my all time favorite baby girl pictures – love the pink! I met newborn baby A. today for a morning session, and she gets the “best sleeper of the year” award from me! Slept for almost three hours through several prop changes on tummy and back, then for a couple of beanbag poses, and for some family shots! As a newborn photographer, I know how important variety of good poses and colors is to my clients, and I am so happy that we did super well with the photos today. Here are some of my favorites from the session!